According to CONCACAF the Association which controls Caribbean soccer Jamaica is not entered in the Juvenile Soccer Championships. The President of the Jamaica Football Federation, Dr. Ron Gordon has denied this vehemently. Jamaica has not only a moral but a legal right to be entered, Dr. Gordon has said. THE JFF president explained that a letter had been sent to the secretary of CONCACAF, Mr. Fortin in November of last year saying Jamaica was sending a team of 17 players and five officials. After waiting several months and not receiving any communication from CONCACAF and because the eliminations were being played the JFF cabled the controlling body for an explanation and was told that Jamaica was not entered. Dr. Gordon says that his correspondence with CONCACAF can be verified by the secretary of the Trinidad FA, Mr. Eric James, who received copies of the letter sent to Mr. Fortin. At this stage it is difficult to say just where the blame lies but one thing is certain—the JFF must have a strong legal right as the moral right Dr. Gordon speaks of does not exist in this sort of thing. Dr. Gordon's claim to moral right arises from the fact that Jamaica was once the host country for the Games and as hosts they were not required to qualify through elimination games. But Jamaica decided that it could not carry the combined burdens of the Commonwealth Games and the Juvenile Soccer tourney the same year so we lost the privilege of not having to play to qualify. Jamaica decided the burden was too great in June last year and Trinidad volunteered to accept the responsibility. Jamaica's application was said to have been filed five months later. Was this too late? 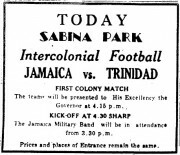 Indeed Dr. Gordon admits that he though that the schedule of elimination matches had already been made and that Jamaica would not be required to play in these and "upset things." This in naive thinking and the JFF must forget moral rights now or become the laughing stock of the entire Caribbean. Let us hope that November was not too late for Jamaica's entry and that Mr. Eric James can substantiate the claims of the JFF.